I was immersed in the first season of Fargo, the television series based on the Coen Brothers' landmark 1996 film, when KUMIKO, THE TREASURE HUNTER fell into my hands. The film, directed and co-written by David Zellner and his brother, Nathan,, explores FARGO's influence from a new angle: the supposedly true story of a Japanese woman who froze to death in pursuit of the buried ransom money shown in the movie. It's strange, isn't it, that the Coens' bleak, snow-swept Minnesota landscape, with its bland, folksy inhabitants, has inspired its own mythos, still resounding nearly twenty years later. The film centers on Kumiko, a Tokyo woman of fertile imagination who is unhappily employed as an “Office Lady,” or “OL.” Kumiko works for a nasty executive who makes her perform menial tasks like picking up his dry cleaning, and chides her for being an old spinster at 29. Kumiko takes subversive revenge by spitting in her boss' daily tea. She doesn't fit in with the other “OL” girls, who chatter on about makeup and marriage. Her mother phones her frequently to chastise her for not dating and refusing to move back home. 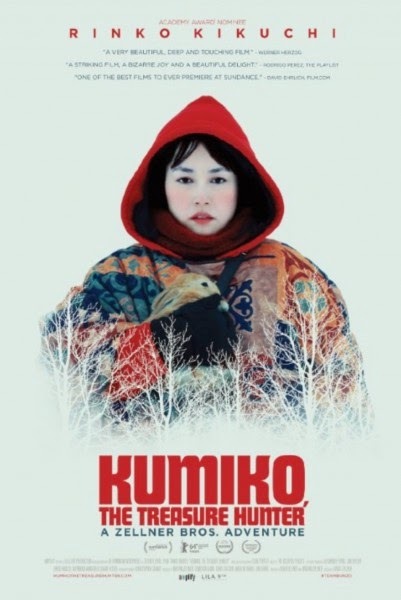 Armed with a hand-embroidered map and only a few words of English, Kumiko takes off on her quest to Minnesota, USA, where she is helped by various well-meaning, Coen-type Minnesotans who can't quite understand why she's there. She crosses paths with a lonely widow, who offers her a warm bed and tells her “solitude is just fancy loneliness.” A kind sheriff's deputy tries to help her by buying her a meal and a thrift-store parka. He tries to reason with her, saying that the Coens' movie is “not real, just pretend, like entertainment.” With its sensitive portraits of the denizens of America's heartland, the story evokes not only FARGO but also NEBRASKA, whose director, Alexander Payne, is a producer of this film. Like Payne's film, it's the story of a naïf in implacable pursuit of an illusory treasure. Quiet, evocatively photographed, and sensitively acted, it's an exquisite little film. As Kumiko, Rinko Kikuchi (who was in BABEL) is marvelously restrained and sympathetic, even when her character's behavior is beyond the pale. The electronic score, by Austin, Texas' Octopus Project, adds emotional resonance. 4 out of 4 stars.